There is a lot of natural gas locked up in shale in the world. Once shale gas was mostly a footnote to the energy industry, known about but inconsequential because mostly inaccessible. But the technology, and hence the economics, of shale gas development has improved. And those improvements are reshaping the world’s energy markets. Although the shale gas resource estimates will likely change over time as additional information becomes available, the report shows that the international shale gas resource base is vast. 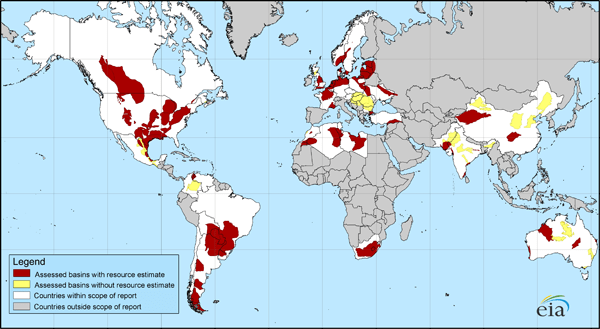 The initial estimate of technically recoverable shale gas resources in the 32 countries examined is 5,760 trillioncubic feet… Adding the U.S. estimate of the shale gas technically recoverable resources of 862 trillion cubic feet results in a total shale resource base estimate of 6,622 trillion cubic feet for the United States and the other 32 countries assessed. To put this shale gas resource estimate in some perspective, world proven reserves of natural gas as of January 1, 2010 are about 6,609 trillion cubic feet, and world technically recoverable gas resources are roughly 16,000 trillion cubic feet, largely excluding shale gas. Thus, adding the identified shale gas resources to other gas resources increases total world technically recoverable gas resources by over 40 percent to 22,600 trillion cubic feet. By the way, the U.S. Department of Energy wants you to know that its early R&D investment in shale gas technology is producing results today. But it isn’t just natural gas. Technology is improving access to oil from shale formations as well. A story in the Wall Street Journal yesterday suggests that Israel may have the potential to become a major oil producer based upon its shale oil potential. See “Could Israel Become an Energy Giant?” In the U.S., oil from shale is one of the reasons North Dakota is booming, and their are several other oil shale efforts now new-and-improved as technology has improved. It isn’t that everything you once thought you knew about the oil and gas industry is wrong, but you do have to pay attention and allow yourself to, reluctantly, learn something new once in a while. Goose Island: What if acquiring capital cannibalizes your market? Environmentalists are working late trying to figure out how they will block this one. It’s going to be touch and go for a while.